Darjeeling: The final tally of candidates in the poll fray from the Darjeeling constituency now stands at 16. Owing to the number of candidates, two balloting units of the Electronic Voting Machine (EVM) have to be placed in each polling booth of the constituency. 21 persons had filed their nominations for the Darjeeling constituency seat. During scrutiny, the candidature of Maheswari Barman and Wajed Ali, both independent candidates, was rejected. While Barman did not deposit DCR cash, Ali's papers were incomplete. Meanwhile, three candidates, namely Pawan Agarwal, R B Rai and Swaraj Thapa, have withdrawn their nominations. 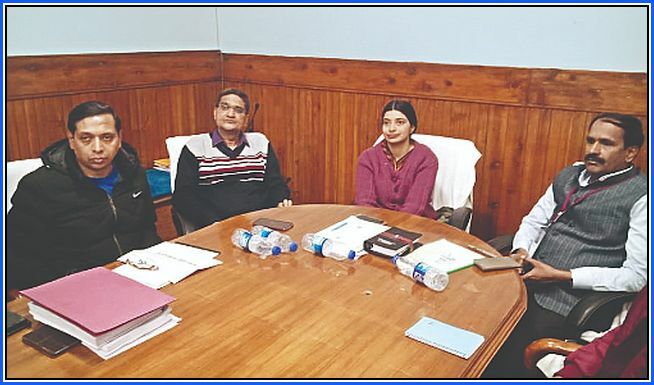 "We have 16 candidates in this constituency and hence two balloting units will be provided in each booth," stated Joyoshi Das Gupta, District Election Officer and District Magistrate. There are 1,899 booths in the constituency. Election symbols for the candidates were also allotted on Friday. The day also saw CPRM candidate RB Rai and independent candidate Swaraj Thapa withdrawing their nominations. While talking to media persons, Thapa stated: "My nomination was a symbolic protest against the idea of repeatedly foisting outsiders for the Darjeeling Lok Sabha constituency." He added that after he had filed his candidature, he had taken up the exercise to unite the Hill regional parties and decide on a consensus candidate from the candidates who were in the poll fray. "I had approached all regional parties along with the Congress and CPI(M). However, owing to time constraint, this could not materialise," said Thapa. Nearly a month ago, the CPRM, while still in the exercise to unite the Hill regional parties and field a consensus candidate, had unilaterally announced the name of R B Rai. "Just to save a fractured mandate we withdrew our candidate. We are holding dialogues with national parties and regional parties. In the next few days we will announce our support to a party or coalition," stated Govind Chettri, CPRM spokesperson. The final tally of candidates in the poll fray from the Darjeeling constituency now stands at 16. Owing to the number of candidates, two balloting units of the Electronic Voting Machine (EVM) have to be placed in each polling booth of the constituency. 21 persons had filed their nominations for the Darjeeling constituency seat.